Glorious warm sunshine greeted 86 eager sailors as they arrived at the tropical location of Northampton Sailing club for the Rooster RS Tera Start of Seasons event, the first of the Squad selectors for the next season's winter training. With a good balance of Pro and Sport rigged boats and a regatta fleet with coaching for those new to fleet racing. The PRO took advantage of the moderate breeze to set a course early and the fleet were launched quickly after a full briefing on the course. With the wind clocking round through the morning and dying towards lunchtime it was decided to do 2 races and come in for lunch before returning to complete the days racing. Race 1 got off on time with the PRO fleet all clear followed swiftly by the Sport fleet. With the wind moderate to light it was all about picking the right side of the course and playing the shifts. Snakes and ladders ensued in both fleets with massive gains to be made or lost from being in the right or wrong place at the right time. In the Pro Fleet Jake Thompson from Frensham Pond took the win from Blake Tudor (Brightlingsea) and Dylan McPherson (Burnham). In the Sports fleet a great start from Max Sydenham (Dell quay) propelled him to victory followed by Adelicia Lavender (Felptham SC) having the race of her life fighting off the reigning champion Alice Davis (Great Moor SC) into third. The Pros began race 2 and with the wind dying the shift playing became ever more important. James Johnson (Windermere) made all the right decisions to take the win from his brother Tom, current Sport National Champion Ben Tuttle (HISC) taking his first podium place in the Pro rig in third. With a general recall for the Sport fleet, the black flag was in place for the second start with Will James (SWYSA) unfortunately paying the price of pushing the line. Tristan Ahlheid (Frensham) got off to a great start only to succumb to Alice Davis at the leeward mark of the second lap and Max Steele (Datchet) eventually pushing past him to take second place. The wind turning super light made it the right decision to go in for a splendid lunch from Elaine and her fantastic catering team. 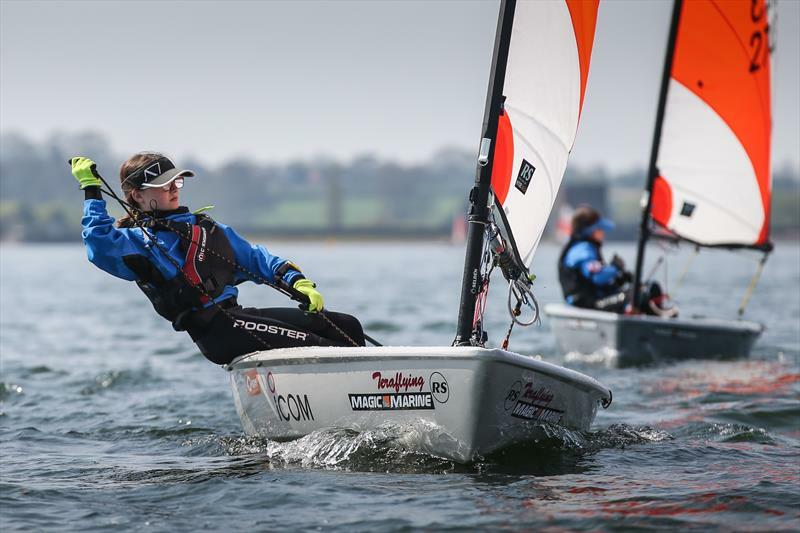 The regatta fleet meanwhile had enjoyed a morning of some excellent coaching on and off the water from Ellen Morley, Dylan Collingbourne and Harrison Pye, all ex Tera sailors who have benefited from the RS Tera Legacy Training Programme. After a 90 degree wind shift the PRO and his efficient team roared out to change the course and get the second half of the days racing underway. For the Pro Fleet it was all change; Blake Tudor pressing the reset button in fine style to take the win from James Knight (Draycote Water) who had pulled out all the stops to keep in front of clubmate Fergus Pye who was finally showing some form. The wind shifting round made it difficult to make any gains on the beat and so the Sports fleet was led for most of the race by Teddy Dunn (IOMYC) after a great start only for him to be pipped to the post by Alice on the final run. Will James (SWYSA) had sensibly put the past behind him and came from nowhere into third after the final reach became a beat and his tacking skills came into practice. The PRO sensibly shifted the leeward gates and after a few drops of rain the wind built nicely for a short while making the next race much more interesting. Becky Caiger (Sevenoaks) got off to a flying start and managed to retain the lead for the entire race from Blake and Albert Gilmore (RDYC) coming good for third. The Sports fleet was quite exciting with much place changing throughout the race; with some very clever tactical tacking up the beat Alice took the win, second not being decided until the final run with a pack of 6 boats vying for the position; Max Sydenham (Dell Quay) finally getting the better of Teddy who retained third. With the first discard kicking in Blake and Alice became overnight leaders. In the regatta fleet some great close racing had left Oskar Shepherd (Great Moor SC) the overnight leader but on tied points with Alex Sydenham (Dell Quay) and Joshua John–Ringe close behind in third. With several families staying on site and a glorious evening much revelry was to be had. After a stormy night and heavy rain the early start was a shock for some but they were greeted with even more warmth and stronger breeze. The Race Committee got straight to work to lay the course and the race was on. 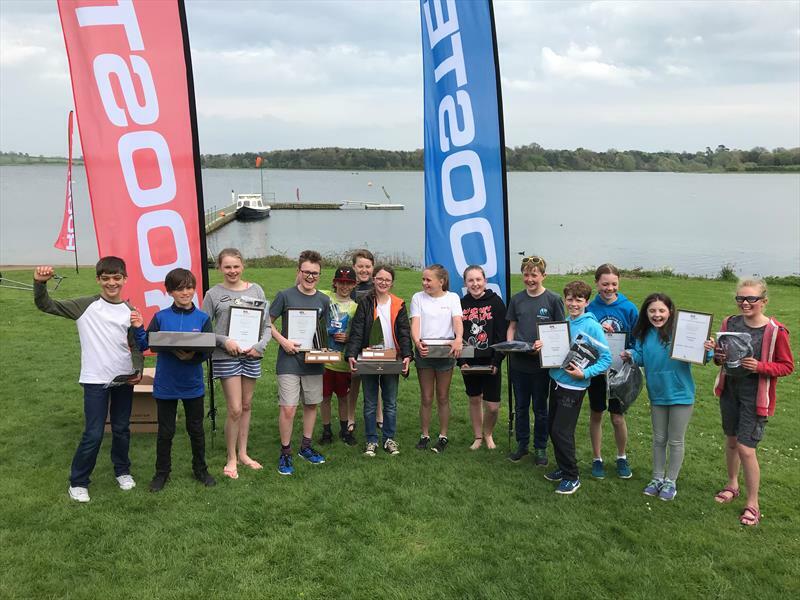 Though stronger, the wind was as shifty as the day before and in the Pro Fleet this time Jack Oakley (RHS) managed to pull away with Albert Gilmore, holding form from yesterday, in quick succession, reigning Sport World Champion Jake Thompson taking third. The Sports fleet was led from the line by Ollie Peters (HISC) who proved that sea sailors can, too, read the shifts, Alice in hot pursuit in second and Frensham's Tristan Ahlheid in third. Race six saw Jack once again reading the course well to take the bullet from Blake with Tom Ahlheid (Frensham) showing his mettle and putting his hat in the ring for prizes. In the sports Gregan Bergmann Smith (HISC) took advantage of Alice having to do penalty turns and roared away from the windward mark with clubmate Ollie Peters chasing him all the way, Felix Powell (Alton Water) sailing brilliantly to third. After a moderate delay due to resetting the course following a large shift to the right, race seven gave Becky Caiger (Sevenoaks), fresh from the RS Feva Worlds in Florida, a fantastic win in the Pro fleet, soaring away from Jack and Tom Ahlheid, whilst in the Sport fleet, Alice pulled herself together to take the bullet (even though she had won with 2 races to spare) Will James (SWYSA) hot on her heels and Tristan Ahlheid in third. The final race of the day caused consternation among the Pro Fleet as several of the front runners miscounted the number of laps required and did an extra lap! Tom Ahlheid (Frensham), however, had his head screwed on and took the win followed by Joseph Warwicker (Bough Beech) and Fergus Pye, proving that mental maths is a vital skill in more than just GCSE test papers. Felix Stewart and Ollie Peters fought it out hard for the final bullet with both banging corners, Felix eventually taking the win with Ollie second and Finlay Lomas Clark (Frensham) in third. In the regatta fleet Oskar continued his form from the day before and sailed to victory overall with Alex in second and Joshua in third. With racing completed early the prize giving was held outside at 3.15pm just beating the rain! With some great prizes from our sponsor for the season Rooster Sailing, children and parents left in good time to make their journeys home. Our thanks go to Northampton SC and their race team for a great event and we hope to return next year for some testing shifty conditions. Our next National event will be at Cardiff Bay for the Nationals; entry is open here. REPORT OF THE MONTH SPONSORED BY Nominate this article for report of the month for your chance to WIN a Henri Lloyd Freedom Visor for yourself and the author of the report that receives the most votes. Just fill in the form below! Why do you like this report?